Patrick Arnould is a stud. When I arrived at his winery in the Grand Cru of Verzenay, he pulled up in his big tractor and jumped out like James Bond out of an Aston Martin. He had a delivery of boxes arriving and ran the fork lift like it was motocross bike. Patrick is the 5th generation winemaker at Michel Arnould, and even though he is my age, he is showing no signs of slowing down when it comes to the real work of the winery and vineyard. He also makes great Champagne. All of his vineyard is in the Grand Cru of Verzenay, Champagnes northernmost of the top crus, and one of the most sought after for Pinot Noir. He supplements this with a little Chardonnay from the Clos Cazals in Mesnil, which he trades his red wine to get. All of his wines have considerable power and concentration, but also freshness that this northern terroir always seems to have, even when it is at its most vinous. This village has a signature flavor: hazelnuts. I find it to be one of the most identifiable villages in blind tastings. 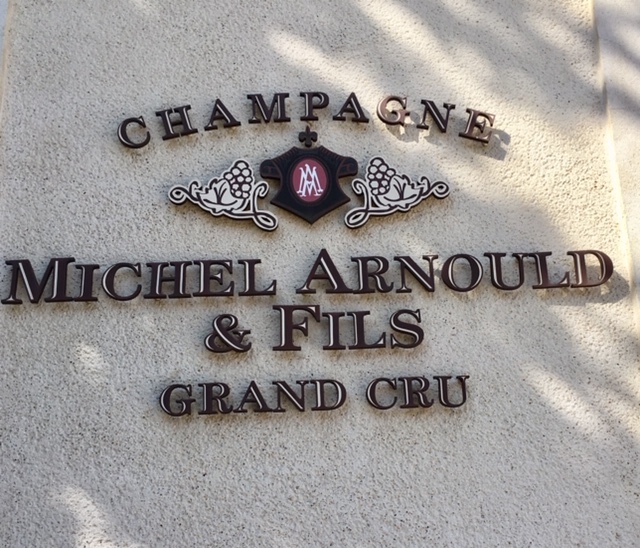 If you have never tried his wines, his Michel Arnould "Reserve" Brut Verzenay Champagne is a must at just $32.99. This is an unheard of price for Grand Cru, and especially for pure Verzenay. The wine spends three years ageing on the lees and benefits from 1/3 of older reserves in the blend. The composition is 2/3 Pinot Noir and 1/3 of Chardonnay. The generous aromatics of this wine impress me every time. It is loaded with sourdough toast and hazelnut intrigue, as well as hint of dark cherry Pinot savor. In the mouth, it is silky, with a compact bead of lovely streamers. The back end is as snappy as the palate impression is smooth, this wine finishes nice and dry with a great impression of chalk. As well as tasting through his whole range of Champagne, we took a moment to taste his excellent 2018s. His wines have from this vintage have better acidity than his colleagues, and he has decided to make Memoire de Vigne in 2018. The tank of this all ancient vine blanc de noir looked like a toy… There is not much of this made. Our initial allocation of the 2012 sold out almost instantly, and I am hoping to talk him out of a little more. It will be at least six years until we see the imposing 2018. I will be counting the days!